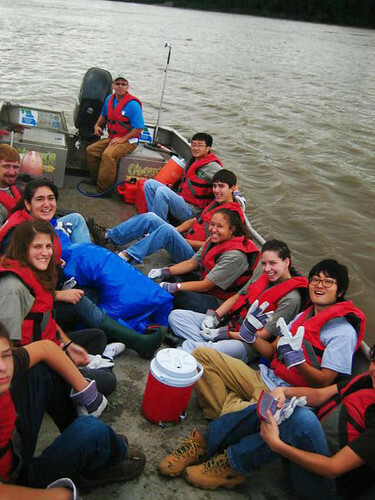 2,115 Volunteers removed 55 Tons of Trash from 79 miles of river! Flexibility was the rule in 2010. Despite high water throughout the valley, River Relief volunteers got a lot done. From a chilly March clean-up at the Confluence of the Missouri and Mississippi Rivers to a chilly May clean-up below Gavin's Point dam in Yankton, SD - from a handful of local students filling a boat with flood-deposited trash to 380 volunteers cleaning 10 miles of the Missouri River near Kansas City, the Missouri River Relief project kept the momentum. What makes it possible is a confluence of engaged partners with a simple, but difficult goal. It's a community that ignores city and state boundaries but instead gathers along a single river. There's the nucleus of our dedicated volunteer crew. Since 2001, they've put in long weekends, travelled the length of the Lower Missouri River many times over, honed our event systems and shepherded over thousands of volunteers onto boats to clean up the Big Muddy. There's the citizen groups and individuals in each community that welcome our project and help get it done. There's the volunteers from countless groups, families and backgrounds that give up their Saturday morning to improve their river. There's our fleet of boat operators. State and federal agencies, local river-oriented businesses, friends with boats, outfitters with fleets of canoes - they all share the belief that this is part of their duty to the river they love. Get people out on it to make it better. There's our long list of sponsors and partners - they provide the cash and services it takes to mobilize this clean-up effort. From fuel to t-shirts to reusable water bottles to dumpsters. It's a community effort. Next year is our 10th anniversary - 2001 to 2011! Keep posted - we've got some exciting plans cooking! See you on the river in 2011!